This morning, Pope Francis met with humanitarian and relief organizations that are dealing with the ongoing crisis in Syria. The meeting was organized by the Pontifical Council “Cor Unum”, which coordinates the Church’s charity work. “The Holy See’s concern for the crisis in Syria, and in a particular way, for the people, often defenseless, who are suffering as a result of it, is well known. Benedict XVI repeatedly called for a ceasefire and for a search for a resolution through dialogue in order to achieve a profound reconciliation between sides. 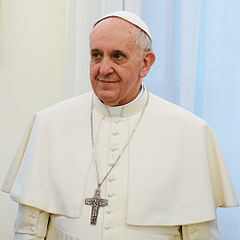 Let the weapons be silent!” the Pope exclaimed. “The destiny of the Syrian people,” the Pope continued, “is a concern that is close to my heart also. On Easter Sunday I asked for peace: “above all for dear Syria”, I said, “for its people torn by conflict, and for the many refugees who await help and comfort. How much blood has been shed! And how much suffering must there be before a political solution to the crisis is found”. This entry was posted in Article, syria news and tagged Middle East, pope francis, syria, syrian civil war, Vatican City. Bookmark the permalink.